Garlic is an Allim (onion) family closely related to onions, shallots and leeks. It grows in various parts of the world and it is very popular ingredient used in cooking for its strong smell and taste. Garlic is also used for medicinal purpose as it has a lot of health benefits. To get the best garlic is to plant at the right time. Best time to plant garlic is mid-autumn or early spring. Plant garlic four to six weeks before the ground freezes in your area. Plant close to the autumn to grow best. Garlic is usually called a bulb and each segment is called clove. In each bulb there will be 10 to 20 cloves. Garlic has high sulfur compound called Allicin which gives the most health benefits. Growing garlic is very easy and inexpensive. It comes in different varieties in size, shape, taste and color. There are two subspecies of garlics one is hard necked and other one is soft necked garlic. Hard necked garlic are the original garlics grown by growers. Before planting garlic prepare the soil. Choose the best variety of garlic to grow according to your region. Garlic prefers well-drained, rich loamy soil with lots of organic materials. Avoid clay soil as garlic won’t grow well. Add compost, manure and nutrients to the soil and make sure the soil has a good drainage before you plant garlic. Soil pH should be slightly acidic to neutral. Choose a best location where they can get direct sunlight or partial shade will also do. Garlic grows well in a wide range of climates, very hot or humidity region. Garlic seed is a clove of garlic, each clove produce a new bulb. Buy garlic from store or from your local market. Make sure you buy fresh, quality, organic and large garlic bulbs. Choose the strong clove and avoid the soft one. Remove the cloves from the garlic plate carefully without damaging the base of it. Plant the clove directly into the soil pushing them about 2 inches deep. Make sure you plant the clove tip upward the soil. Plant the cloves into row giving space about 8 inches apart. Once planted the cloves into the soil cover the soil with straw, mulch, dried grass clippings and leaves. Sprinkle litter water above them to wet the soil. Water them an inch of water every week during growing period. It will take 4 to 8 weeks to grow depending upon the climate and the variety of the garlic. Garlic need balanced fertilizer to grow healthy. Apply organic fertilizer which contains base nutrients NPK or use seaweed mix with fish emulsion mix into a gallon of water and apply on garlic. Clip off the flower so that the plant can concentrate more on bulbs. Harvest garlic when you see the leaves turn yellow brown. Carefully dig up each bulb without breaking the stalk from the bulb. Once you harvest the garlic tie them in a shaded dry area or in your garage for about six weeks. Choose best container for planting garlic. The container should be at least 8 inches deep and has a good drainage system. If you are willing to grow more garlic choose the big wider container. Prepare soil mixing potting soil with your garden soil. Keep the ratio as 3:1 of soil to potting mix. Fill the container with soil leaving an inch from the top of the container. Once you prepared the soil, start planting the clove deep into the soil pushing the cloves at least 4 to 6 inches deep. Sprinkle the water, making the soil wet but not soggy. Allow the water to drain well before you water them. Place the pot where it can get at least 8 hours of direct sunlight. Best place to keep is kitchen window sill. If you are not able to provide them the natural light then you can place them user grow lights. Garlic will take 8 to 10 months to fully mature. Once the leaves start to dry, harvest your garlic. Store your garlic in a dry place and use them whenever you required. Bananas are the most popular fruit in the world. Bananas don’t grow on trees. Rather they grow from a root structure that produces an above ground stem. The plant is specifically classified as an arborescent perennial herb. It is the largest herbaceous flowering plant in the world, which grows up to 15 meters long. It is said that there are almost 1000 varieties of bananas grown worldwide. Most common variety is Cavendish variety grown more than 150 countries. Over 100 billion bananas are consumed annually in the world, making bananas the 4th largest agricultural product in the world following wheat, rice and corn. Bananas are one of the healthier natural food sources in the world. They are very low in calories and are high in vitamin B6, fiber & potassium. They also contain decent amounts of phosphorus, magnesium, calcium, iron, zinc, copper, selenium, Vitamins A, B1, B2, C, E, K Niacin & Pantothenic Acid. Plantain (Banana) grows well in tropical region. They prefer warm and humid weather. They can be cultivated in a temperature range of 10°C and 40°C with high humidity. Bananas yields higher when temperatures are above 24°C for a considerable period. Plantain prefers full sun to partial shade and will tolerate a wide range of soil conditions. Plantain is adaptable to a wide range of growing conditions and can be sown outdoors directly in mid-spring, or start indoors in early spring and transplant outdoors in late spring. To plant a banana, remove a 12 inch side shoot from the main banana tree. Make sure you separate them carefully using a pruning knife. Before you separate the shoot, prepare the location for planting the banana. Choose a location where there’s a direct sunlight with a loamy soil having a good drainage area. Dig a hole as deep as to accommodate the shoot’s rhizome. 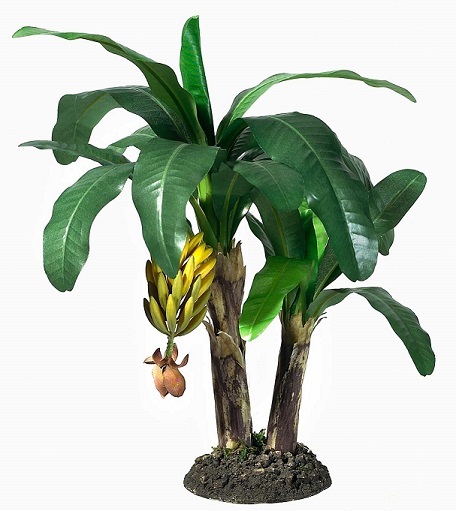 Plant the separated banana shoot carefully into the hole make sure not to damage the rhizome. Back fill the hole with the loosened soil and tamp the soil down with your hand. Apply a 2 inch layer of organic mulch around the base of the newly planted plantain shoot. Water the soil to keep the soil moist but not soggy. Plantains need constantly moist soil. This plant requires a large amount of water during warm climate apply at least 2 inch water everyday but ensure they drain well. Feed your plant at least once in a month especially at blooming period. Use good balanced fertilizer like 5-5-5 or 10-10-10. Do not fertilize in winter climate. Bananas are heavy feeders so feed them plenty of nitrogen and potassium. Apply chicken manure. Prune most of the suckers, as they take away nutrients and moisture from the plant. Remove all excess shoots from the parent, let the shoots grow 4 leaves and then remove from its parent plant. This will help the plant to grow healthy and concentrate on their flowers and fruits. Each plantain blooms only one single flower, once the plant bear fruit the plant intend to die. You can harvest when the fruit changes its color to light yellow from dark green. Carefully cut the bunch of banana and keep them in a dry place to fully ripe. You can eat the fully ripe banana or use the raw plantain as vegetable. The entire plantain is used in few countries. Its leaves are used as plates, its raw plantain, stem and flower used as vegetable. Its stem is also used to make rope. Radishes are fast growing root vegetable grown all over the world. They come in a wide range of varieties like cylindrical salad radish, large Oriental radish and rat-tail radish. They are Cherry Belle which comes in cherry shape, red in color with crispy white flesh. Another variety is White Icicle which comes in 8” long white in color. Dailon white radishes are huge which comes in 3” diameter with 18” long. Before you plant choose the best variety for yourself considering your location. Radishes are great and easy growing crops especially growing in fall gardening. These crops tolerate the heat of the summer and the cold of the fall and spring. It takes less than 3 weeks from planting to get mature; you can enjoy the fresh and crisp radishes less than a month. They can be easily grown outdoors, indoors and in containers. Jolly Speedy Seeds, Pink Beauty and Sparkler 3 are the best varieties suitable for container gardening. For planting radish in container get 12 inch diameter pot with an excellent drainage system. Fill the container with gravel, small rocks and growing medium and make them moist. Plant the best quality radish seed half inch deep and cover it with soil. Mist the soil using spray bottle to damper the soil. Ensure that you dampen the soil and do not saturate it. Place the container in a sunny area where they can get plenty of sunlight per day. If you are not able to provide them enough sunlight then use grow lights. Water them every day but make sure you do not over water it. Seeds will start germinating after 3 to 7 days. Once the plant sets out true leaves, thin them keeping only healthy one. It takes 3 – 6 weeks to be fully matured. Harvest them and enjoy your tasty crunch crop. For outdoor planting ensure to choose a location where the radish can get plenty of sunlight. The soil should be loose and well-drained soil. Remove any kind of rocks over the area. You can also make raised beds for planting radishes. Check the pH of the soil, for planting radish the pH of the soil should be at least 5.8 and 6.8. and also add good compost lot of organic matter to your soil. Sow the seeds into the soil about 1/2 inch deep and 1 inch apart. Within 3 to 4 days the seeds will germinate. Once the seedlings grow to 1 inch thin them. Radishes grown as a companion plant as they keep the bugs off the plants. As a companion plant you can grow carrots, parsnips and cabbages along with them. Water them regularly making sure not to over water them. Radishes do not require fertilizers but you can use organic food to grow radish in full balance nutrients. Harvest your tasty radish within 4 to 6 weeks. 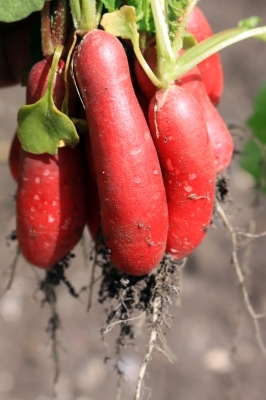 If you prefer sweeter radish then harvest them when they are in small size. Mature radish can taste more peppery. Radishes are eaten raw or used in salads along with carrots, beets, cucumber and lettuce. Radishes are one of the low calorie root vegetable which has a good source of vitamin C. They help boost immunity system in our body and also very good for the liver and stomach.